SERT 1 (Space Electric Propulsion Test) was a suborbital test flight of ion engines built by NASA's Lewis Research Center. 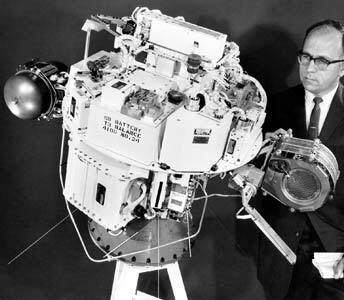 SERT 1 was launched on 20.07.1964 on a Scout-X4 rocket from Wallops Island. This flight experiment had a 8-cm-diameter cesium contact ion engine and a 10-cm-diameter mercury electron bombardment ion engine and was the first successful flight test of ion propulsion. The cesium engine was designed to operate at 0.6 kW and provide 5.6 mN of thrust and a specific impulse of 8050 s. The cesium flow was controlled by a boiler and the porous tungsten ionizer electrode. The mercury ion engine provided flow control via a boiler and a porous stainless steel plug. A hot tantalum wire was used as the discharge cathode. Beam and accelerator power supply voltages were 2500 V and 2000 V, respectively. The engine had a 1.4 kW power level with 28 mN of thrust at a specific impulse of about 4900 s. Each of the ion engines had a heated tantalum filament neutralizer.